English 101 is a full tune & service DVD that covers pre unit and unit Triumphs and unit BSAs. In this interactive shop manual, watch step-by-step as Wes White of Four Aces Cycle demonstrates everything you need to keep your British bike reliable, on the road and running great. This 4-hour DVD is broken down into easy-to-follow chapters and is designed to teach you how to maintain your British motorcycle. English 101 is Region 0 and will play world-wide. At over 4 hours of run time it is packed full of everything you need to keep your bike on the road and running great! The English 101 Triumph & BSA Tune and Service DVD has received rave reviews, take a look in the gallery at just a few from DiCE Magazine, Motorcyclist Magazine, and Cafe Racer Magazine. 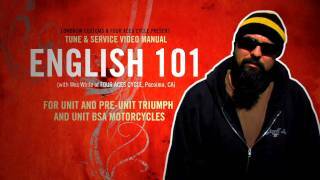 Lowbrow Customs English 101, English 102 & Triumph 650 Rebuild DVD - 3 DVD Set - Save $10! Great Information. Seeing is Understanding. Here's my review of he DVD. I really like this DVD, it has a lot of great information adding much to my understanding on how to maintain my T100R. I wish I had such information in this format when I had other Triumphs. I could have saved a bunch of money... Seeing how to do something written in manuals and online is for me, the best way to understand what needs to be done. Information regarding pre-unit Triumphs BSA's may come in handy someday if I find myself with one or need to help someone with their's. Wes does a good job hosting the DVD-sets the right tone and explains things pretty well. Chapter 1 goes into quite a bit of detail doing a valve job. I appreciated demonstrations with the motor on and off the frame. Chapter 2, Finding TDC was very helpful. My bike has the two notches on the crank, but seeing how to use the degree wheels will come in handy in the future. The Ignition chapter was good, but I'm not sure I'll ever install a Joe Hunt or Lucas magneto (never know...). I would have liked to see more on timing with the light on all ignitions especially points (both 4CA and 6CA). I especially liked the clutch adjustment segment clarifying the manual on how to adjust the free play at the clutch push rod. The part explaining how to determine the right amount of slack in the clutch cable using the kick lever was also helpful. Nice tip too on keeping the clutch plates free by kicking through with the clutch lever pulled. The oil and carb chapters were great. Information in the Electronics chapter was helpful especially the use of the circuit tester. I would have liked to see a more detailed explanation on removing and replacing the wheel bearings-using the right drifts and other tools, etc. Overall, a whole lot of information on this disc. Would be nice if I could navigate to certain points quicker and without needing to see the brief ride intro's before each chapter (although they were entertaining while sitting here in PA in subzero temps). As I said at the start, I liked it. I'm sure I'll refer to it several times. I'm now considering the 102 DVD. Keep up the helpful good work you guys do. Thanks. I bought my first Triumph a while back and knew nothing about British bikes......I was a little worried about my lack of knowledge. I certainly knew these old bikes needed a lot of maintenance. After watching just the first of the three videos I'm quite confident that I can not only "maintain" my Bonneville,...but I'm looking forward to completely restoring it! Best money I've spent in a long time. This video is well done. Everything you need to know on maintaining your ride is covered here. Buy this! This DVD is great. It was immediately helpful and will continue to be so down the road.